Hubby and I are debating Edward Snowden, the constitution, and the rights of government… again. These debates are loud and often include superlatives not fit for a family-friend blog — though I’m usually the first to toss them out in argument. “Snowden is a spy and traitor and needs to be punished to the fullest extent of the law,” hubby proclaims. “And it’s okay with you if our government violates the very constitution on which it was founded without our ever knowing?” I query. Hubby repeats his statement. I respond with a variation of my question. Repeat the above scenario ad nauseam, adding and rearranging superlatives for emphasis and amusement. Recently I was making a nine hour drive home after being away on family business and, to keep me alert, hubby called to debate our favorite topic. I finally became so incensed with his one-lined argument that I told him to either add something new or shut the superlative up! Satisfied I wouldn’t fall asleep at the wheel, he told me he had to go back to work. Who would have thought that watching civil war movie Copperhead would take us straight into a debate about Edward Snowden. Yet it did. If you don’t know about the recently released movie Copperhead, it makes for an interesting watch. With beautiful cinematography and score, the unfolding story centers on a small town in upstate New York in 1862 and plots those in favor of the civil war against the few dissenters who did not believe in war. Those dissenters were referred to as Copperheads. So, where does Snowden come in? The movie is rich in dialogue about the constitution and the interpretation of government rights afforded by said constitution. It’s the same argument that hubby and I have whenever he wants to infuriate me or keep me from falling asleep at the wheel. While Copperhead is touted as a movie for history buffs, I believe it has the potential to be more. Not only does the movie present how difficult it can be to stand up for one’s convictions, it also symbolizes the universal debate on government power, political alignment and the interpretation of the constitution. Regardless of your opinion about Edward Snowden, the movie Copperhead reinforces the notion that the debate over interpretation and application of the constitution will never end. It simply reinvents itself. According to hubby if I lived in upstate New York in 1862, I would have been a Copperhead — you know, the lone dissenter. Of course, I must disagree. 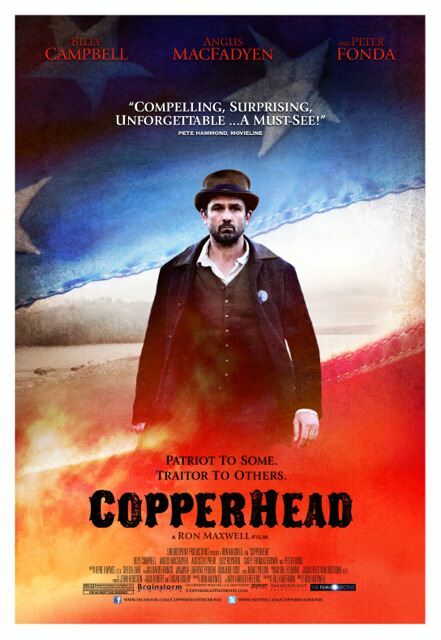 Copperhead the Movie is available in select theaters and on demand.